That said, a few Early Saxon features have been recorded, one consisting of pits and ditches (NHER 41021) and situated just north of the Fye Bridge, an area considered to be a centre of Early Saxon settlement. Also of interest is a cemetery (NHER 165, NHER 26606) situated at the very north of what would become the medieval settlement, just north of the later city walls. Objects recovered from this location include a 5th century bowl, brooch and tweezers. Other objects recovered are limited to pottery sherds (NHER 801, NHER 43297), although a small number of metal objects have also been recovered. These include brooches (NHER 690, NHER 748), a buckle pin (NHER 745), and a Roman coin fashioned into a pendant (NHER 37553). It is during the Middle Saxon period that the city of Norwich as we know it begins to take shape, with many of early street and place names deriving from this period, such as the Conesford and Coslany areas. How the settlement developed, and whether it sprang from one site or multiple sites, is still debated, but it has been suggested that the name Northwic, from which the city derives its name, originally referred to a settlement north of the river either side of the southern end of Magdalen Street. The one area for which we do have a number of archaeologically investigated sites both north and south of Fye Bridge. One possible building has been noted to the south of Fye Bridge (NHER 26585), and occupation also continued on the Early Saxon site on the other side of the river, 100m to the north (NHER 41021). Also thought to date to this period are a number of pits, post holes, possible buildings and pottery sherds from a site also on the south bank (NHER 26442), just 100m east of the Fye Bridge. Stray finds from this period are very limited, consisting of occasional pottery sherds (NHER 801, NHER 831), and one possible coin (NHER 654). Although Danish raiding had occurred for some time, their settlement in East Anglia can be confirmed from the defeat of the East Anglian king Edmund, in 870. However, in 917 East Anglia fell to the Saxon king Edward the Elder, so the historical period of Danish control is short. As a result, it is very difficult to distinguish Danish buildings or monuments from those of the Late Saxon or Anglo-Scandinavian period. 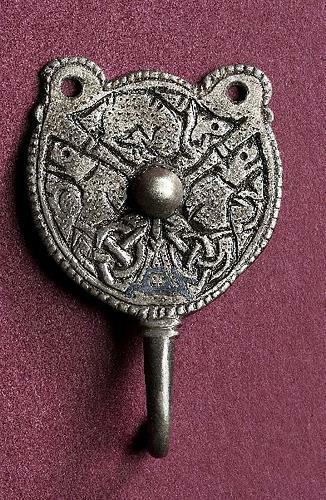 The greatest legacy of the Danes is therefore their artefacts, which include Borre and ‘Viking’ style brooches (NHER 416, NHER 41383), a fragment of a Mammen-style cross shaft (NHER 131), and a Ringerike-style mount (NHER 450), as well as some church dedications such as St Botolph (NHER 587). Interestingly the presence of a chapel (NHER 578) to St Olaf, who was martyred in 1030, indicates the continued presence of the Danish community in the following period. Following the conquest of 917, there was a marked increase in the number of settlement sites, and the first confirmed industrial sites. Excavation has also revealed evidence of a Late Saxon defensive ditch at sites on St Martin’s Lane (NHER 161), Botolph Street (NHER 281, NHER 284), St George’s Street (NHER 302) and Whitefriards (NHER 834). Occupation sites are present on both the north and south banks of the River Wensum, notably in the area between St George’s Street and St Martin-at-Palace Plain. Indeed, it is from this period that we have the first evidence of a bridge in the city, at Fyebridge (NHER 62), where a wooden causeway and planked road were observed in sewer works in 1896. On the south bank occupation covered the present Cathedral Close to the east and the area of the later Castle to the west. Recent redevelopment of the river banks has resulted in a number of excavations where evidence of warehouses and waterfront reinforcement has been recovered (NHER 450, NHER 40367) as well as industrial activity such as antler working (NHER 41303), iron working (NHER 37379), metal smelting (NHER 156), leather working (NHER 421) and weaving (NHER 584). The presence of such sites around the waterfront indicates the primary importance of the river, and of industry and trade, to the city during this period. However, further inland a number of pottery-production sites have also been identified (NHER 59, NHER 98, NHER 118), including one (NHER 135) probably demolished for the construction of the Norman Castle. Other sites show the presence of buildings (NHER 39789), floors (NHER 43968), hearths (NHER 48921), and frequent pits (NHER 41946, NHER 49769) and ditches (NHER 41021, NHER 40497). The large number of churches of the Late Saxon period indicates the extent to which the city had expanded from its small beginnings. Many of these were destroyed by the construction of the Cathedral, including St Michael Tombland (NHER 586), St Mary in the Marsh (NHER 585), and the Holy Trinity Church (NHER 590). The presence of these has led to the conclusion that some of the densest Late Saxon settlement lay in this area. Limited excavations have returned some evidence for some surviving features for these and other buildings, (NHER 39471, NHER 39455), but these areas had been substantially disturbed by post medieval activity. Although the names of the above churches have survived, excavation has revealed one (NHER 416) that was previously unknown. This particular building was of timber-construction, and both it and the attached graveyard appear to have been in use for less than a hundred years. The human remains and associated objects, which include a brooch, tweezers, strap ends and bone skates, give us a fascinating glimpse into the lives of those living in Norwich just before the Norman Conquest. Other churches known to have existed in the Saxon period include St Vedast (NHER 395), which was situated just east of the Castle and was demolished between 1540 and 1541, though the street still bears its name. Also of note are All Saints (NHER 589) demolished in 1550, St Botolph (NHER 587) demolished in 1548, and St Winwaloe (NHER 581), the later given over to private use after the depopulation of its parish by pestilence in 1349. The majority of surviving churches, such as St Martin-at-Palace (NHER 584), were rebuilt in the medieval periods but here at least we know of at least one timber church on this site in the Late Saxon period, though there appears to be some evidence of Late Saxon work in the nave and chancel. St John de Sepulchre is thought to retain Late Saxon transepts, and it has also been suggested that St Edmund’s Church at Fishergate (NHER 577) and St Ethelreda’s Church on King Street also began during this period. Late Saxon objects have also been recovered from across the modern city, some of the most interesting being a silver suspension ring (NHER 26242), and a silver scabbard mount and belt-hook in the Trewhiddle style which retained the remains of inlay (NHER 15057).